No professional installation is needed. Record footage in the cloud, view anywhere, anytime. Your footage can be viewed on any device. Custom service plan to meet your requirements. You can choose lowest cost or best quality. Protect your home & family; monitor kids/pets; live video streaming, playback & motion alerts. 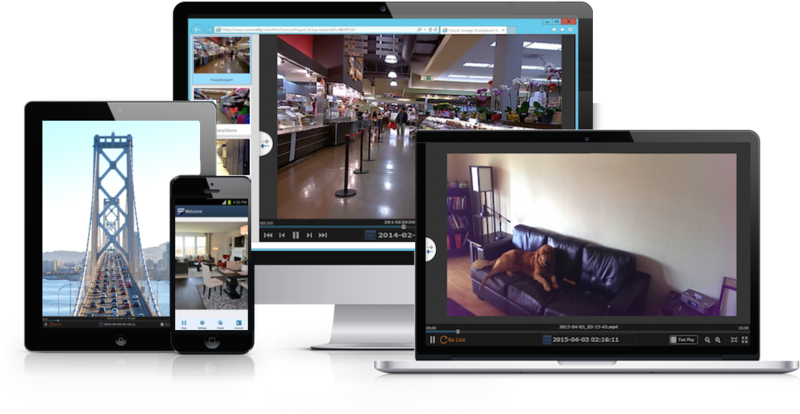 Remotely monitor offices and shops with multiple cameras; back up footage to the cloud! Publish cameras on your web page; share cameras with the world; live streaming & broadcasting. You just need to configure your camera/DVR to upload footage to CameraFTP for storage and remote monitoring. It is designed for users who already have an IP security camera / DVR and know how to configure the IP camera/DVR. Webcams, smart phones and tablets can be used as security cameras and CCTV DVR systems by installing CameraFTP VSS or Mobile Security Camera APP. With regular IP cameras / DVRs, you need to configure them to upload directly to your CameraFTP account. CameraFTP offers 3-day free trial. Please visit our support page for detailed info on how to configure an IP camera. To use webcam, smartphone or tablet as an IP camera, you just need to install CameraFTP VSS software (for PC) or Mobile Security Camera App (for mobile devices). You can also use our Virtual Security System with your IP cameras. VSS can connect to your cameras' video feeds and display the live views just like a CCTV system. In addition, VSS can automatically upload video clips to the cloud. Low-cost IP cameras usually can only upload image snapshots. With VSS, you don't need to buy expensive IP cameras to upload video clips. Watch your securely stored footage from your desktop or smartphone, receive motion alerts, download data for preserving evidence, share or publish cameras with others. Just download CameraFTP Viewer App or use any browser.